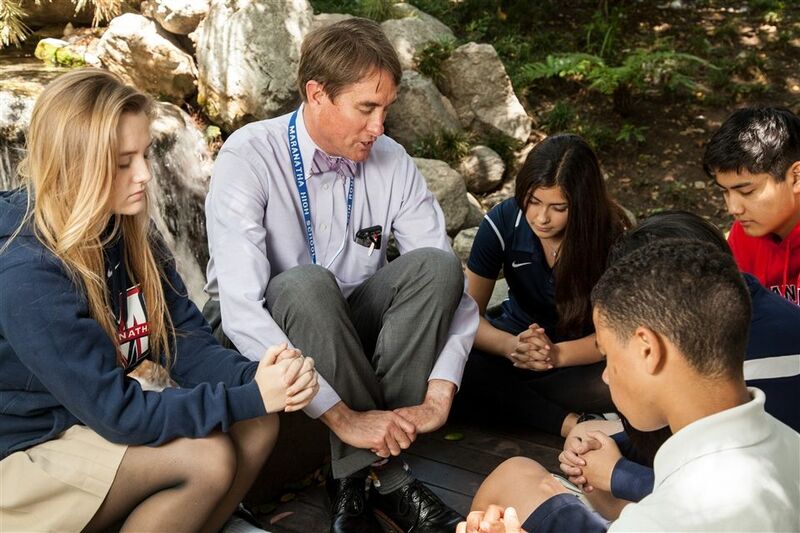 As a Christian college preparatory high school, we desire to see our students, faculty, and staff grow in their relationship with Christ on a daily basis. It is our desire that all that we do in life, school, athletics, work, and play are all done for an audience of One. Our hope and prayer this that through the various activities done on campus that our joy will be in Christ no matter what is going on in our lives. As we do life together our goal is to help each other to keep our eyes on Jesus and find our joy in Him alone knowing that if we do, we will truly lack nothing. Maranatha’s chapels happen each Thursday morning before lunch. Chapels provide the Maranatha community an opportunity to engage together in worship, pray as a community for what is happening at school as well as around the world, and be encouraged in our faith through messages being given by Maranatha faculty and staff and local pastors and Christian leaders. One of the differences in being a student at Maranatha is that we want each student to have a safe place to share what is happening in their lives. To that end, we have established Advisory Groups and each student is placed in a group with others from their class as well as a faculty or staff member to lead the group. Meeting weekly on Tuesday mornings, Advisory Groups are a place for students to dig deeper into their faith as well as have an advocate on campus. Each year the Maranatha community reaches out beyond our borders to serve God and others through mission trips. Students, who wish to step out in their faith, apply to go on one of the mission trips and teams are prayerfully selected. In the past few years Maranatha has sent teams to Harambee Ministries in Pasadena, New Orleans for hurricane relief, the Dominican Republic, Colombia, and Armenia. It is amazing to see how students grow when given the chance to put hands and feet to their faith and join in with what God is doing in various parts of the world. As the Maranatha community prepares for Thanksgiving we pause to give back. Being grateful for all that God has done for us, we are driven to give back to others. During the two days before Thanksgiving break, as advisory groups, we go to various ministries and service projects in the greater Los Angeles area to serve and help as we are able. Not only do the service opportunities create a place for us to give back but they also draw Advisory Groups together as they serve together. Do you have a prayer request or a praise report? Send them to prayer@mhs-hs.org or an Instagram message @MHSSpiritualLife and the Ministry Team will be praying with and for you. Your message will be reviewed by the Chapel Advisor, who will then share them with the Student Ministry Team so that they can pray for each request that comes in. Each Friday morning before school starts, students lead a time a worship for all who are interested. There are several weekly Bible Studies at Maranatha High School led by both local pastors and teachers. Each Bible Study is created specifically to equip and resource our students with necessary tools such as Biblical literacy and faith integration that are needed to impact this world as Salt and Light. Each semester Maranatha High School desires to intentionally carve out a thematic conference style week known as “Spiritual Emphasis Week” where we gather to participate in various forms of spiritual disciplines such as prayer, fasting, worship, and celebration.